Office Sorting Units help manage and organize literature, mail, forms, and numerous other types of documents. 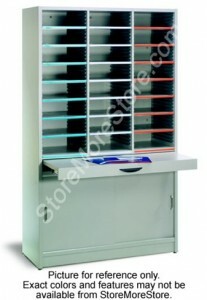 StoreMoreStore offers a variety of Office Sorting Units that will meet your specific needs. We also provide a variety of accessories including shelves and labels that will help you neatly and efficiently categorize documents. A great floor saving unit is the freestanding Office Sorting Unit. You can choose from many different types of freestanding Office Sorting Units that have the right amount of storage space for your specific needs. Also, the unit has a retractable work surface for looking through mail and literature that holds about 40 lbs. You can use the surface and then push it back in when you don’t need it anymore. The shelves come in three different sizes: standard, legal, and oversize that are available in many different colors. The neat thing is that you can also have all the shelves be clear. Why would you want a clear shelf? It’s a competitive advantage. Someone who is shorter can look up into the top shelf of the Office Sorting Unit to see if there is something hiding underneath. Also, the shelves are adjustable on 1 inch increments with full support on both sides. The lip of the shelf fits and slides easily into the slots. You can also easily adjust the shelf even if it’s fully loaded with papers, which is a great feature that you are not going to be able to get with traditional millwork. The Office Sorting Unit has labels to help you index. There are letter and legal labels for indexing along with a version for oversize shelves that goes all the way to the edge of the shelves. The indexing label clips onto the edge of the shelves so that you can easily change them without having to use anything sticky like glue or tape. You can also use the indexing labels for color-coding information. For example, different regions or different departments can use different colors. The plastic label is also magnified so that when you look at it, it is larger and easier to see. Shop online now to see all of our Office Sorting Units with retractable work surfaces, adjustable shelves, and full width labels. If you have any questions or need any assistance, please give us a call at 1-855-786-7667. Don’t see what you are looking for? Then give is a call toll free at 1-855-786-7667 or send us an email. We will be happy to help you find the Hamilton Sorter parts you are looking for. Shop StoreMoreStore for all your mail and literature sorting needs including Stand Alone Mailroom Sorters, Freestanding Sorters, Pass Thru Mail Sorters, and Closed Back Desktop Sorters! Keeping your desk organized can be difficult. A Hamilton Sorter Closed Back Desktop Sorter from StoreMoreStore is perfect if you need a place to manage and store all your mail, literature, forms, and documents because sorters save you time by keeping you organized. 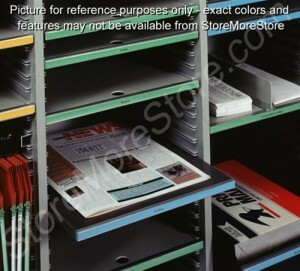 Easily Adjustable Sliding Mail Shelves: Sorting shelves and trays slide in and out on tracks making opening heights between shelves easy to adjust. Easy to Read Colored Labels: Sorter trays or shelves have full length name labels that are easy to change. Transparent Mail Sorting Shelves: The transparent sorting shelves let light pass through the sorter unit making stored documents and mail easier to see. No Sharp Edges on Mail Shelves: Mail sorter shelves are designed with no sharp edges to guard fast moving hands when sorting mail. No Assembly Required: Sorting units come fully assembled, just open the carton, set the mail sorter in place, and slide in the sorter shelves to use. Wide Choice of Colors of Mail Sorters: Hamilton Sorter has a large variety of sorter color finishes to match any office décor. GREENGUARD® Certified: Hamilton Sorter’s Closed Back Desktop Sorters are GREENGUARD® certified offering a environmental friendly addition to your office. Whether you’re in Charlotte, Atlanta, or anywhere else in the USA, you can shop online today at StoreMoreStore for great deals on Hamilton Sorter Closed Back Sorters! Looking for extra shelves or parts for your Hamilton Sorter table top Sorter or Stand Alone Mailroom Sorter? 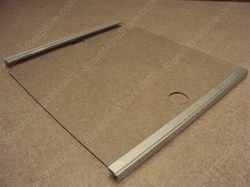 We have all the shelves, trays, drawers, and sorter parts you need. Give us a call today toll free 1-855-786-7667 or send us an email and we will help you with all your Hamilton Sorter Product needs. Ever been in the situation where no matter what you try and do paper work and files keep piling up and taking over your work space, so not only is your desk overcrowded but you can never find what you’re looking for? Well StoreMoreStore has a solution for you that will save you space while keeping you organized, Oblique FastFile Shelf Organizer. The Oblique FastFile Shelf Organizer is a space efficient paper management system that organizes documents, files, forms, literature, and mail for quick access and space savings. The Oblique FastFile Shelf Organizer is easy to assemble and sets in your workstation overhead or on a shelf. The Oblique Shelf Organizer comes with a starter set of Oblique V-base and Box-Base side tab folders. The side tab folders have magnified label holder viewing lenses that make reading easy on the eyes. 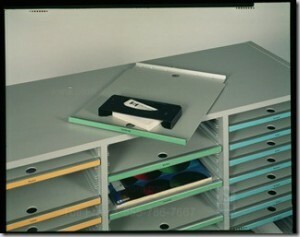 Simply categorize your paperwork into the hanging file folders and hang them on the Oblique FastFile Shelf Organizer. Are you curious to know exactly how much space you can save with Oblique Shelf Organizers? Well here is an example for you. 60” of literature stored on six shelves, uses about 21 square feet with an estimated shelving cost of $450. Just one 40” Organizer unit can store about 39” of literature in just 4 square feet with an estimated cost of $200. Unlike shelving that needs additional air space to access literature, the Oblique FastFile Shelf Organizer saves space by side tab labeled folders that expand and contract to compact literature. The Oblique FastFile Shelf Organizer come in three standard widths of 33-3/4”, 39-34”, and 45-3/4”, but special sizes are available, just email us or call us toll free at 1-855-786-7667 for a custom size to fit your space. 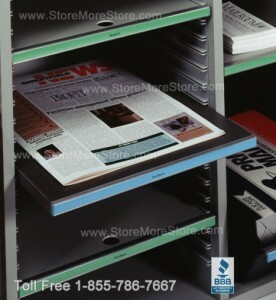 Shop now at StoreMoreStore for your Oblique FastFile Shelf Organizer to save space and organize all that paperwork! 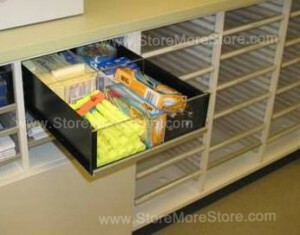 Looking for some accessories for your Hamilton Sorter mailroom furniture? 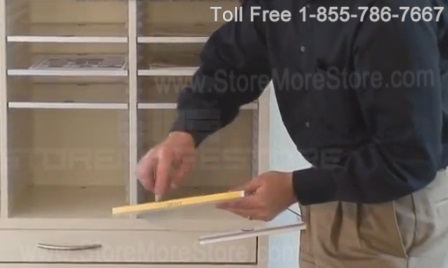 Shop online at StoreMoreStore.com, we have a full line of all the Hamilton Sorter accessories including mail sorting shelves, name labels for indexing your mail cubbies, mail trays, and office supply drawers for all those clips, rubber bands, and markers, all at great prices! While you’re there, check out our Hamilton Sorter Stand Alone Sorters and Desktop Sorters. If you don’t see that exact Hamilton Sorter part you need, send us an email or give us a call toll free at 1-855-786-7667. We will be happy to help you with all your Hamilton Sorter mailroom furniture and accessories. Visit our website, StoreMoreStore.com today or call us toll free at 1-855-786-7667 and we will help you get the right sorter accessory to meet your storage needs. With a large selection of mail sorter modules, there are many different choices to make regarding what type of mail sorting cabinet to buy. Choosing mail sorting cabinets that are safe to use, easily adjustable, and designed for accuracy and productivity will provide years of use. Understanding the differences between mail sorters before your purchase will help you make a better decision. 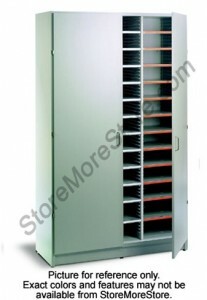 Choosing a safe mail sorter. One trait of sorting mail is quick hand movements. Some sorters are made of thin steel. Steel sorters seem to be a wise choice until your hand accidentally hits one of those shelf edges. Ouch, that hurts. Sharp metal shelf edges and quick hand motions don’t go well together. With StoreMoreStore sorters you won’t find any blood on our shelves or bandages in one of the sort cubby’s because our shelves are made of strong, durable 1/8″ thick polyethylene specifically design for safe mail sorting. Choosing a flexible mail sorter. Mail is a constantly changing business. People come and go, and those darn envelopes and packages come in all different shapes and sizes requiring mail openings to be adjusted from time to time. To adjust most sorter shelves you need to be an engineer equipped with a level. Really, lining up eight shelf tabs in those itty-bitty slots? Once you accomplish adjusting one shelf you will feel pretty proud of yourself until you notice the shelf is crooked. It’s not hard to get to a shelf crooked when the slots are on 1/4″ centers. Well, we think differently at StoreMoreStore. Our shelves are easily adjustable on 1″ increments. 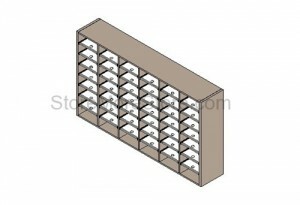 Shelves are fully supported along each side of the shelf to hold up to 35 pounds per shelf. Choosing a labeling system. Labeling system? What does that have to do with mail sorting? Duh, like everything!!! Most mail sorters are designed to use the same labels you use for your file folders. You know the white sticky ones that fall off when you want them to stick and stick when you want to remove them. Our sorter shelf labels are 10-5/8″ wide by 7/16″ spanning the entire length of the shelf. They are safely and securely positioned behind a clear snap-on plastic protector. Changing labels is a snap. We have colored labels available to identify different type of materials or for high activity mail slots. Using colored labels increases speed and accuracy when sorting materials. Do you need options to make your job easier? 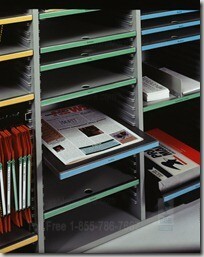 We have optional products to make your job easier, like drawers that slide into mail sorter slots. These drawers are great for storing rubber bands, paper clips, pens, markers and other supplies commonly used at a mail sorting station. Other options include roll-out waist high work shelves, doors, and shelves for binders or other materials. We hope that this information helps you make an informed decision when selecting mail sorters and mail center equipment. Oh, we almost forgot our sorter modules look nice too. They are available in a wide choice of finishes. 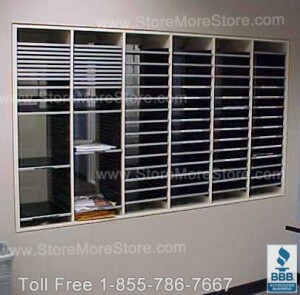 Shop for freestanding or desktop sorters with confidence at StoreMoreStore, knowing that our mail sorters are quality products backed by a Better Business Bureau A+ rating. Get free shipping and great mailroom sorter deals here!